This solar panel tracks the sun using solar cells. It’s a pretty interesting technique, and can be done on the cheap. The rectangular panels are doing the actual energy harvesting. The circular modules seen below are solar cells from some landscaping lights. 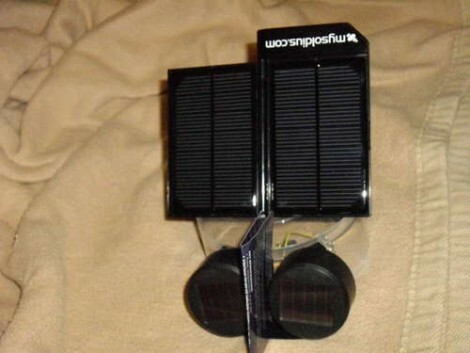 They’re being used as sensors to help judge if the device is aimed directly at the sun. We’ve already seen this type of thing done with a quartet of light dependent resistors. In this case, if the negative leads for both landscaping lights are connected, a voltage may be read from the positive lead of each panel. If you measure that voltage, and use a rotating stand to adjust the position until the readings balance, you can be assured that your array is getting the optimal amount of sunlight. [Gtoal] had been trying to drive motors directly from the output lines of these panels without success. We’re sure there’s a simple analog comparator circuit which would facilitate this. Grabbing a small microcontroller is another option (and some chips have an analog comparator built in). Exactly like the circuit I posted last time here when someone was using a duino to do it. I got mine from the R. Simms book that was published in 1968. This stuff has been around for decades, I strongly suggest everyone putting down their Arduinos and learning analog electronics. Yes, it’s a Miller Solar Engine, commonly used in BEAM robotics. It’s in the class of circuits known as relaxation oscillators. Charge accumulates in a capacitor. The voltage rises until it reaches a threshold, then the capacitor is dumped into the load in a pulse; which is capable of briefly turning a motor. The process then repeats, with the frequency of pulses determined by the amount of power input. LED’s are very tiny solar cells…with built in directional lenses. It’s not interesting, its the thousand repetiton of a stupid idea: to “track” the sun. It’s position can be calculated since mayan times (at least until the end of 2012). Tracking it by light is prone to failure, clouds, etc. and will waste useful power for jiggeling the panels around to follow a cloud. I built a similar circuit for analog temperature control of a kegerator. I had to compair my probes analog voltage to two reference voltages for High and Low and then trigger a relay based on a comparators output of those voltages. It should be super easy to use just the comparator input both sensors voltages and to send a 5v signal output to a relay or motor controller based on the rotation desired. Maybe $10 in parts? We had a customer come in a few years ago with a similar request. We found that putting a pair of Solarengine circuits head-to-head to the same motor did a great job of lining up a solar cell. He came back a few weeks later with his project (linked above to our Flickr stream). Cool implementation! Clockwork! Chinese knew too. Use the MC for return to morning position, storm sensing slew to minimize hail damage etc. You will have to aim once a month or so for elevation, we are just hitting peak everywhere north the equator. i saw someone use the hour hand of a clock. No electronic parts whatsoever aside from some solar panels and maybe a transistor.